The Milwaukee Public Museum’s famous Hell Creek diorama. Photo by the author. 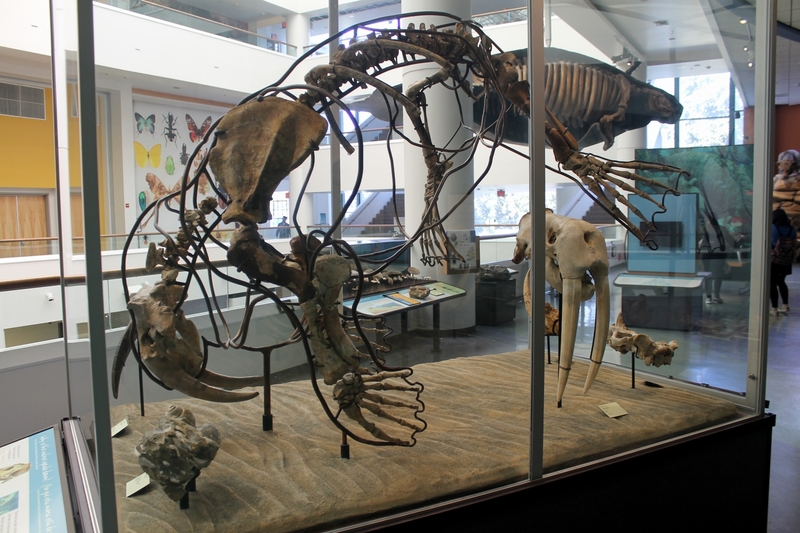 The late 19th century saw a wave of large natural history museums established in urban centers across the United States. From the American Museum in New York City to the Field Museum in Chicago, these institutions were born out of a desire to provide public access to knowledge and culture. Opening its doors in 1884, the Milwaukee Public Museum (MPM) was part of this trend, but it has always differed somewhat from its peers. For one thing, MPM was (and remains, in part) a municipal project, and its collections are publicly owned. More obvious to visitors, however, are the uniquely crafted, immersive exhibits that have always been a part of this institution’s identity. Referred to by staff as the “Milwaukee style,” these exhibits de-emphasize cases of artifacts in favor of large-scale theatrical scenes that recreate particular times and places. 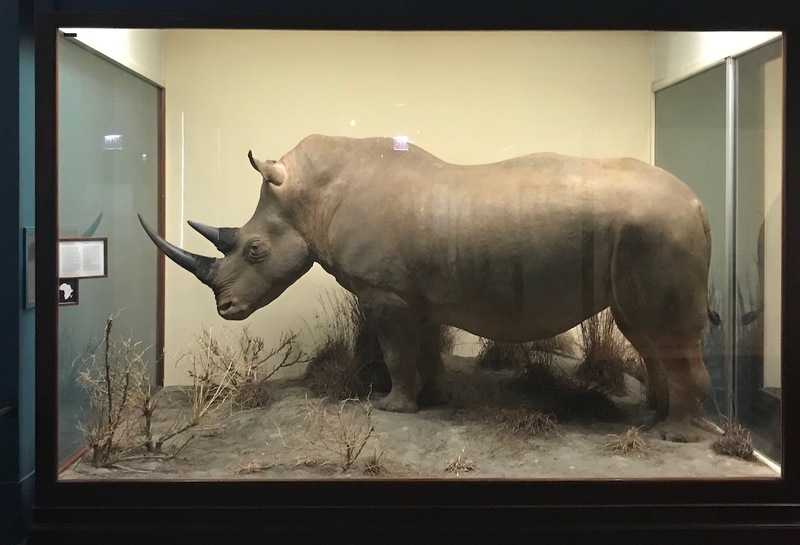 While the museum boasts a collection of four million natural and cultural objects, the public-facing exhibits favor models, set pieces, and sound effects that immerse visitors in the story being told. This approach started early. 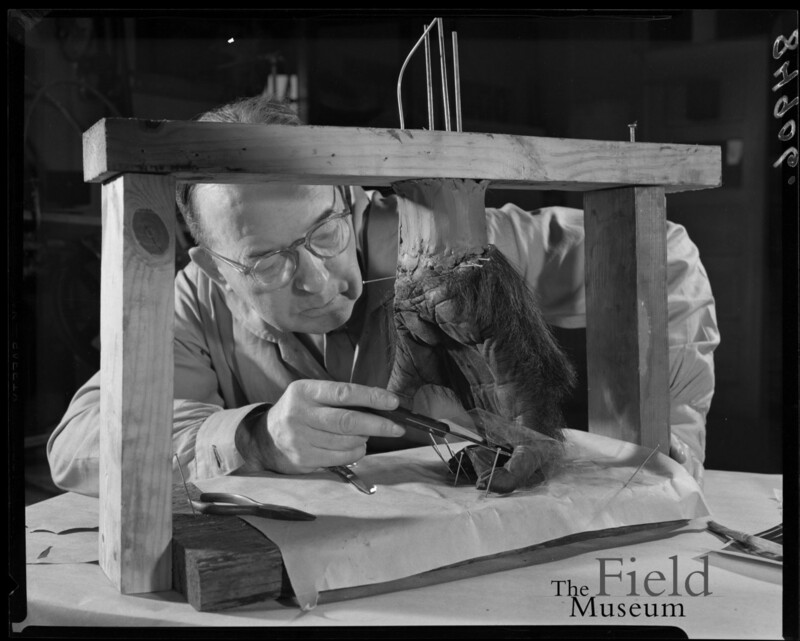 In 1890, “father of modern taxidermy” Carl Akeley created his first habitat diorama (a muskrat colony) at MPM. 1965 saw the opening of the locally beloved Streets of Old Milwaukee, a walk-through recreation of shops and houses from the turn of the century. Other examples of the Milwaukee style include a 12,000 square foot, multi-story artificial rainforest, Guatemalan and Indian marketplaces populated by mannequins and taxidermy animals, and some of the biggest, most ambitious habitat dioramas to be found anywhere. Map of The Third Planet from a 1980s student worksheet. 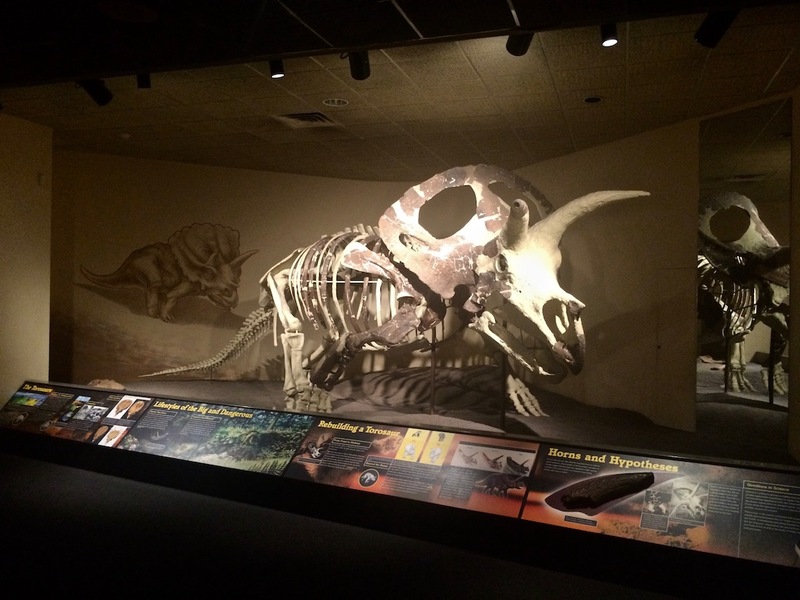 Most pertinent to this blog is the paleontology exhibit, called The Third Planet. Now over 35 years old, The Third Planet is dated scientifically but remains a masterful example of Milwaukee style exhibit design. Its most celebrated component is a 2,500 square foot diorama of a Tyrannosaurus eating a Triceratops in a Late Cretaceous cypress swamp. 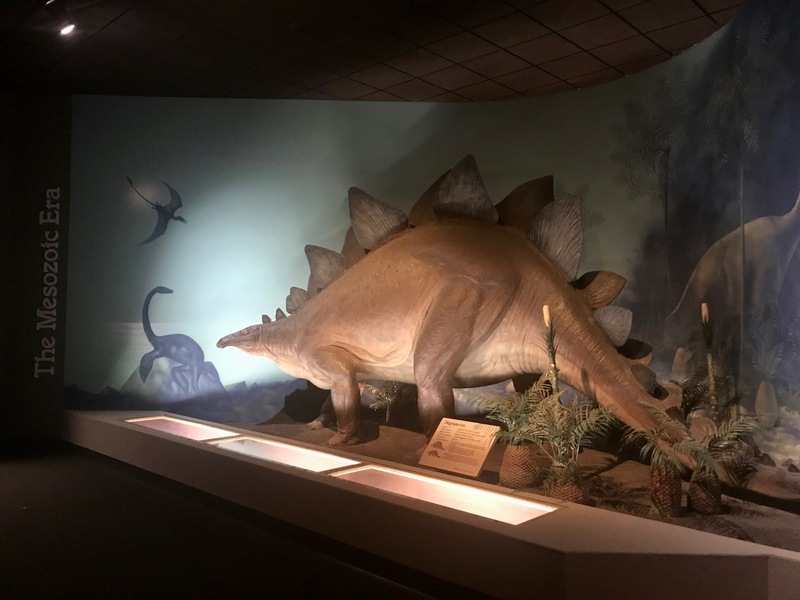 If you haven’t been to MPM, you may well have seen photos of this display endlessly reproduced in dinosaur books from the 80s and early 90s. Nevertheless, the inception of the exhibit was less about the dinosaurs and more about geology. According to former Curator of Geology Robert West, The Third Planet was primarily conceived as an exhibit about plate tectonics. 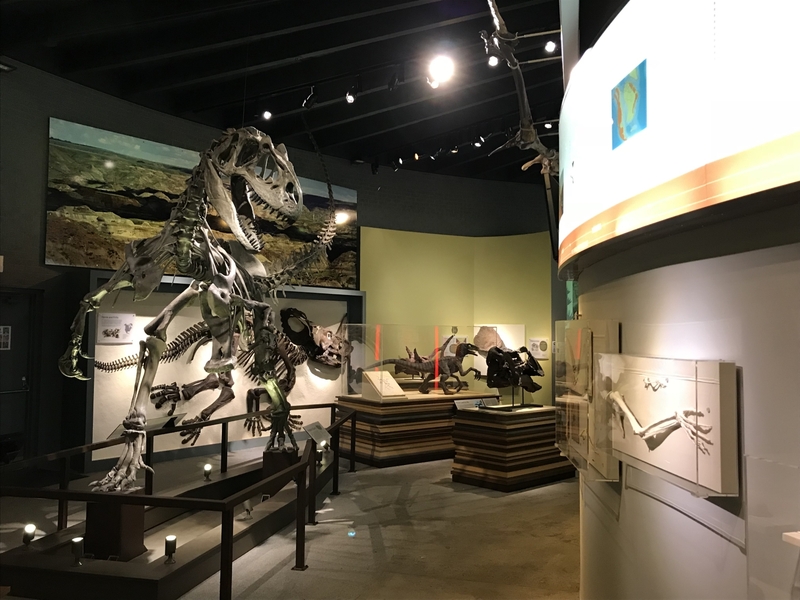 MPM’s previous geology and paleontology exhibit, called A Trip Through Time, opened in 1964 and omitted plate tectonics as a unified explanation for geological processes like mountain building, as well as the distribution of plants and animals in the fossil record. While the general principles of continental drift had been around for decades, it wasn’t until the 1960s that the idea became a universally accepted theory underlying all of earth sciences. A Trip Through Time was on the wrong side of that sea change, and West and his colleagues were keen to correct it. 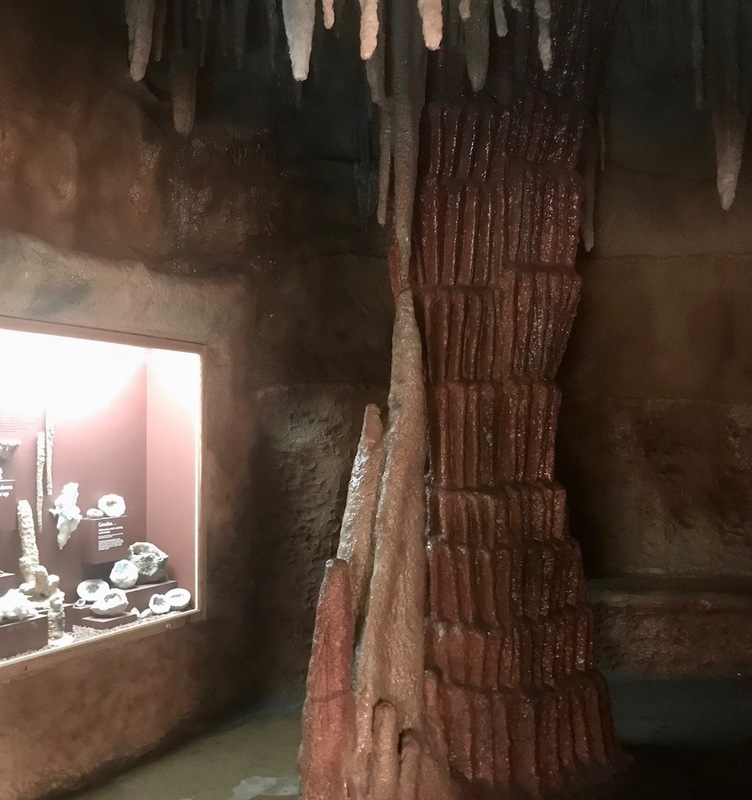 In 1977, the community-led support organization Friends of the Milwaukee Public Museum provided $20,000 to start developing a new geology exhibit. This seed money allowed the museum to assemble a core concept team: content advisors West and fellow curator Peter Sheehan, designers Jim Kelly and Vern Kamholtz, and educators Barbara Robertson and Martha Schultz. 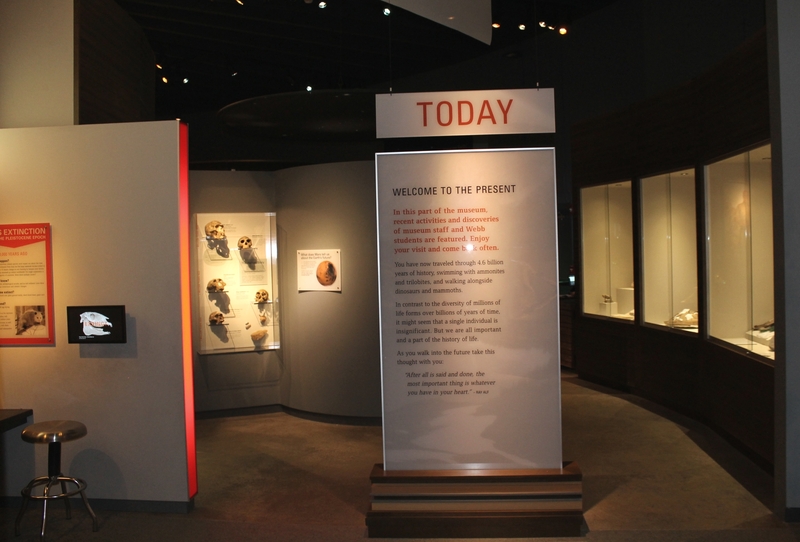 The team began by visiting other museums as a benchmarking exercise, and eventually produced a draft script and statement of purpose for the new exhibit. The limestone cavern is modeled after Cave of the Mounds in Blue Mounds, Wisconsin. Photo by the author. 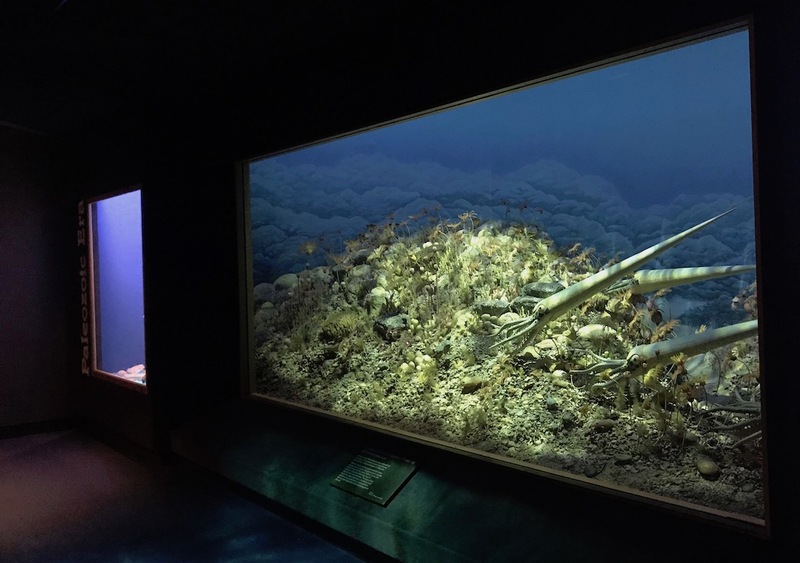 Plate tectonics — and the idea that the Earth and life on it have been in constant motion throughout history — was to be the unifying theme of the proposed exhibit. Visitors would begin with an orientation film, then proceed on a walk through time, visiting a series of reconstructed habitats from the distant past. Highlights would include a limestone cavern, a Carboniferous coal swamp, life-sized dinosaurs, and the edge of an advancing glacier with an enterable ice cave. The overall budget was $1.9 million, a comparatively modest figure made possible by the extensive in-house production facilities already available at MPM. Funded in part by private donations and a National Science Foundation grant, the exhibit was green-lit to start production in early 1979. While the scientists and collections staff worked on deinstalling A Trip Through Time and gathering specimens for the new exhibit, designers Kelly and Kamholtz started producing floor plans and miniatures. Script revisions were an ongoing process, informed by the availability of specimens and practical realities of construction. 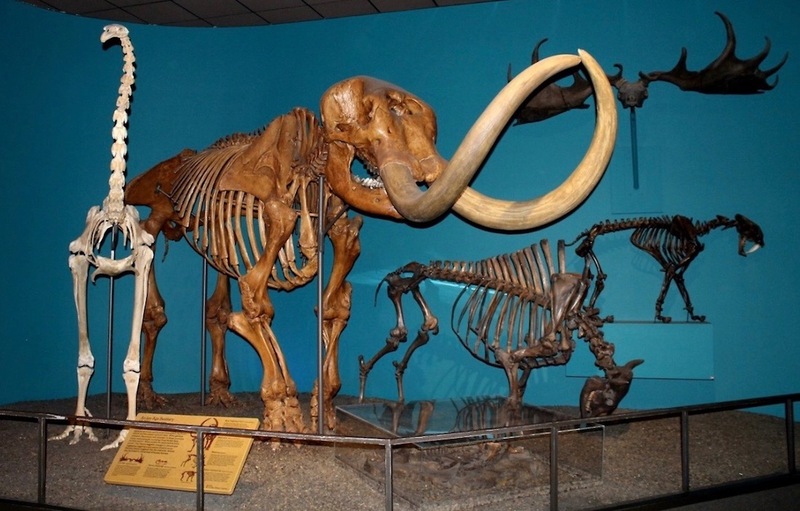 MPM’s historic mastodon was joined by new mounts of a moa and an ice age bison constructed by Rolf Johnson. Photo by the author. The in-house art department had the most daunting job. 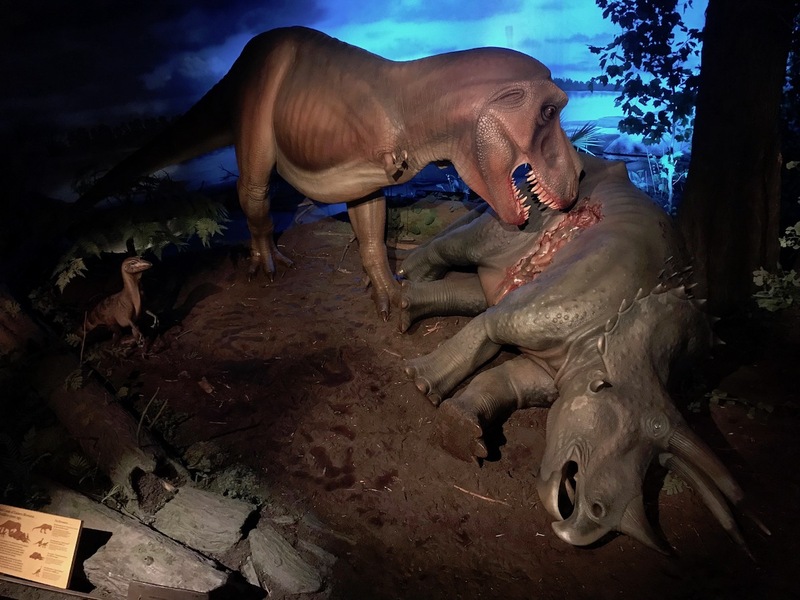 A team including Wendy Christiansen, Floyd Easterman, Mike Malicki, and Greg Septon created no less than six distinct immersive environments from scratch, and designed an assortment of life-sized animals to populate them. Bob Frankowiak, Carol Harding, and Syl Swonski painted the various murals and illustrations. Only a few pieces were purchased, among them a pair of dinosaurs from the famed Sinclair Dinoland exhibition at the 1964 World’s Fair. The Struthiomimus is a Dinoland original, while the Stegosaurus is a duplicate made from the original molds. The Stegosaurus. Photo by the author. 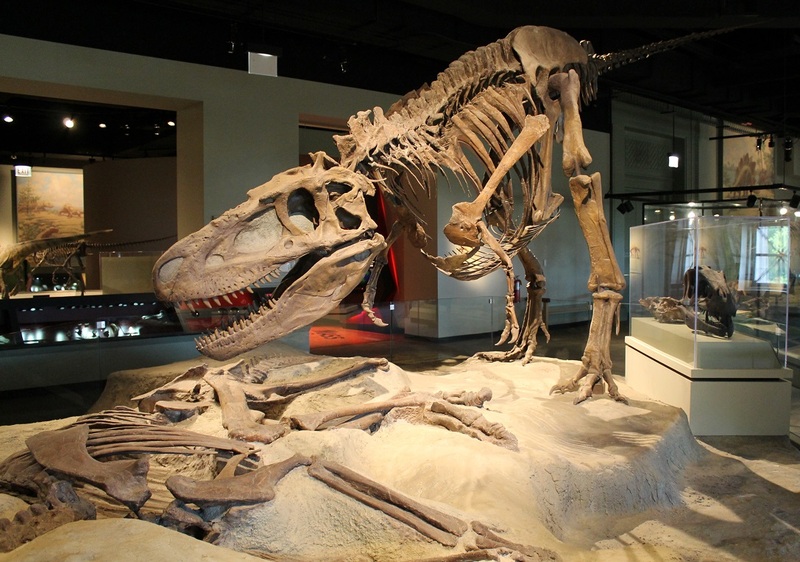 The Tyrannosaurus diorama can be viewed from ground level or from a mezzanine. Photo by the author. The exhibit artists put everything they had into the Tyrannosaurus scene. This was to be the first life-sized diorama of dinosaurs in their environment ever built, so it had to be spectacular. Artists created hundreds of individual fronds and leaves, pressed dozens of footprints into the simulated mud, and populated the scene with animals large and small. Although the bloody spectacle of T. rex digging into the side of Triceratops steals the show, the scene also contains a paddlefish, a Champsosaurus, a tiny mammal, a loon-like bird, and more. No detail was too small: the Tyrannosaurus even has drool (made from clear plastic lacquer) dangling from its teeth. Computer-controlled lighting (state-of-the-art in the early 1980s) cycles through different times of day, and a richly-layered soundtrack of animal calls brings the motionless tableau to life. All told, the diorama was nearly five years in the making from the earliest drawings to final installation. The Ordovician reef. Photo by the author. For the most part, The Third Planet is still exactly as it was 35 years ago. 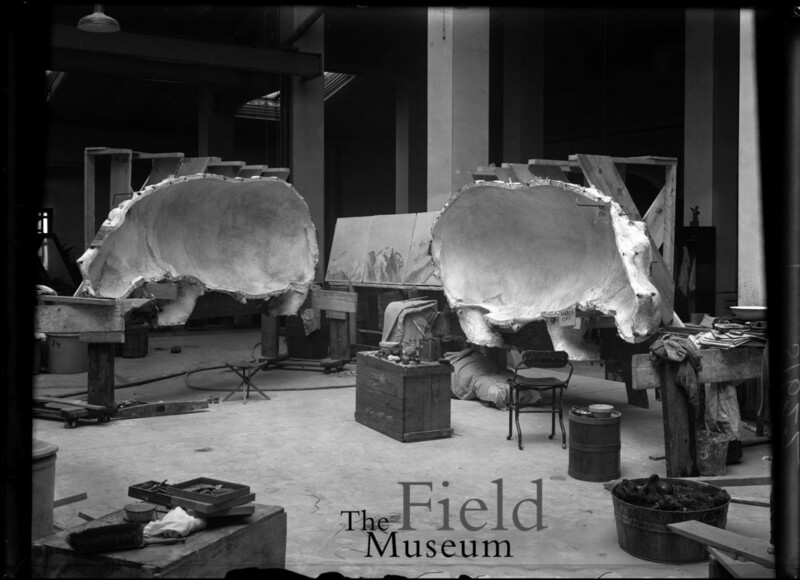 The most significant change was the addition of a mounted Torosaurus skeleton to the exhibit entrance in 1991, replacing the orientation film. 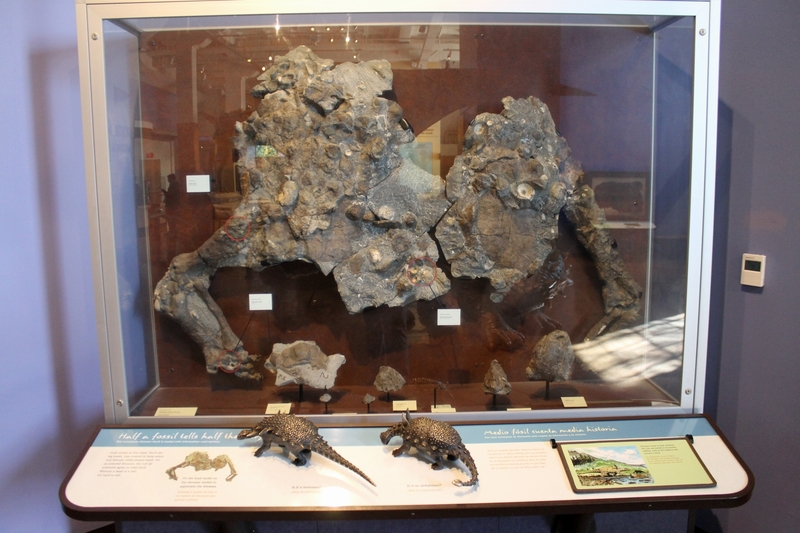 The fossils were found by Bob and Gail Chambers during one of the museum’s “Dig-A-Dinosaur” summer field programs. Rolf Johnson coordinated a team of volunteers to prepare and mount the skeleton, all in view of the public. The now-classic Tyrannosaurus diorama was updated in 2017 with enhanced lighting and sound. According to regular visitors, the scene is now louder and more intense than ever. Two dromaeosaurs were removed from the diorama so that museum artists could outfit them with feathers, but they have yet to be reinstalled. Torosaurus had a colossal head. At nine feet long and nearly as wide, it is rivaled only by modern whales. Photo by the author. Nevertheless, much of the content in The Third Planet is decades out of date. This is largely the result of a major budget crisis MPM faced, and overcame, in the early 2000s. A CFO’s mismanagement put the museum eight figures in debt, and 40% of staff left or were laid off. The museum had to fight for its existence in a conservative-leaning state, fending off unhelpful suggestions to privatize, sell off collections, or close altogether. Happily, MPM is now completely out of debt and looking toward the future. The museum’s collections facilities are in poor shape, and significant renovations would be needed for the institution to maintain its accreditation. Rather than continuing to lobby Milwaukee County (which owns the building the museum occupies) to update the structure, MPM is looking to move to a new, purpose-built location elsewhere in the city. Earlier this year, MPM revealed a series of conceptual images, all of which emphasize bright, open interiors and a mix of indoor and outdoor displays. As explained in the museum’s FAQ document about the move, the best historic dioramas and exhibits would be moved to the new location. That means that, assuming MPM can find a location and funding for the new building, highlights of The Third Planet would surely be restored and re-contextualized in any future incarnation of the institution. 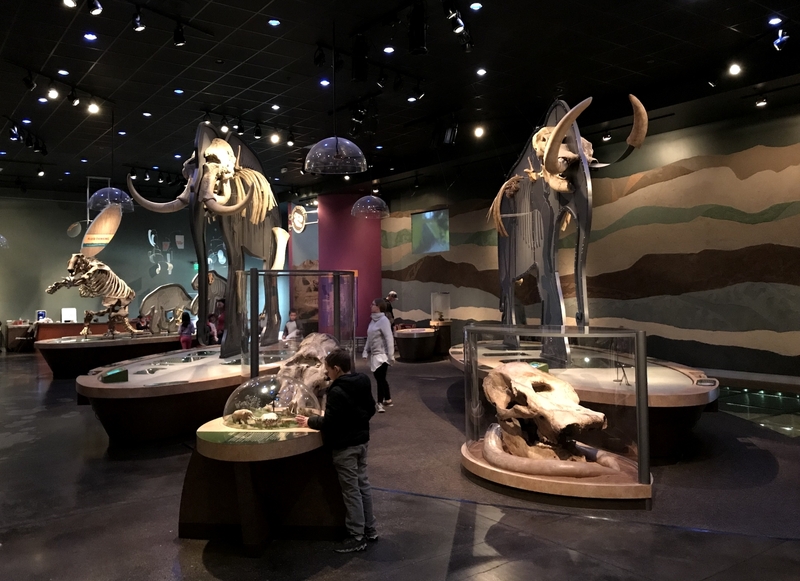 At the very least, the prominence of dinosaurs and fossils in nearly all of the conceptual images makes it clear that paleontology exhibits will be part of MPM for a long time to come. Many thanks to Archivist Ruth King for her generous assistance in accessing materials used for this article. 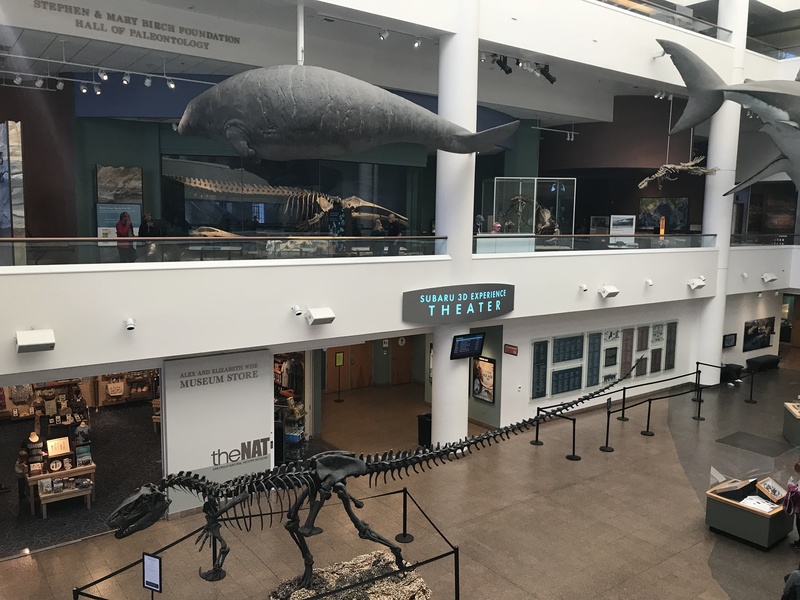 Paleoartist Tyler Keillor has not one but two new tyrannosaur sculptures on display in museums north of Chicago, and this past weekend I paid both of them a visit. Keillor has been reconstructing extinct animals since 2001, most frequently in collaboration with Paul Sereno. You may well have seen Keillor’s fleshed models of Rugops, Kaprosuchus, Eodromaeus, and others, all commissioned by Sereno to accompany press releases announcing new discoveries. Keillor also specializes in restoring incomplete fossil material, assembling physical or digital models of the complete, undamaged bones. The composite Spinosaurus skeleton from the 2014 National Geographic traveling exhibit was his work, as is the skull on the mounted skeleton of Jane the juvenile Tyrannosaurus at the Burpee Museum of Natural History. 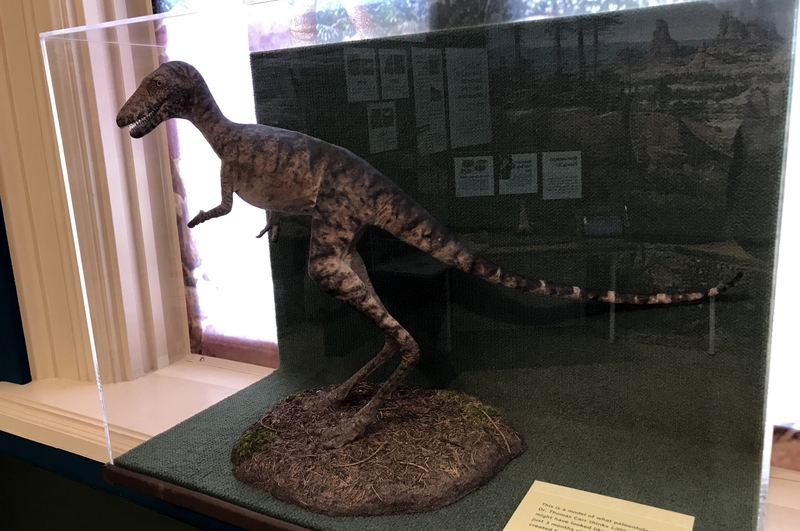 Tyler Keillor’s Dryptosaurus at the Bess Bower Dunn Museum. One of Keillor’s latest and most ambitious pieces debuted on March 24th at the brand-new Bess Bower Dunn Museum in Libertyville, Illinois. 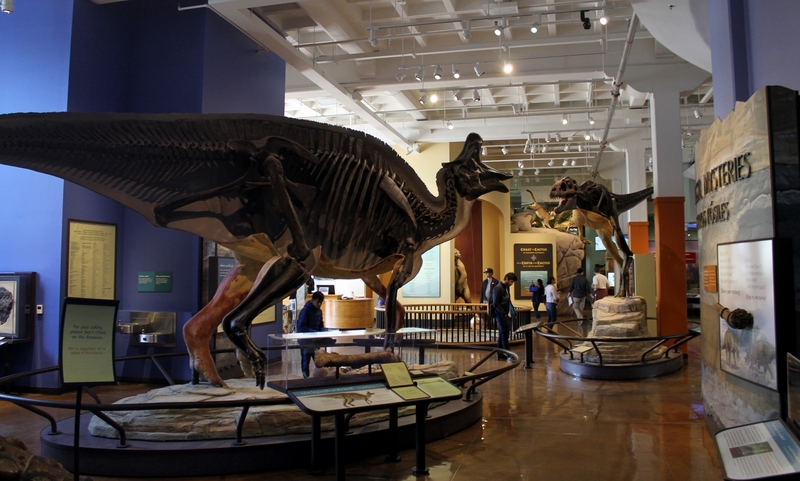 Standing at the entrance to the museum’s galleries, the life-sized Dryptosaurus is a show-stopping centerpiece. 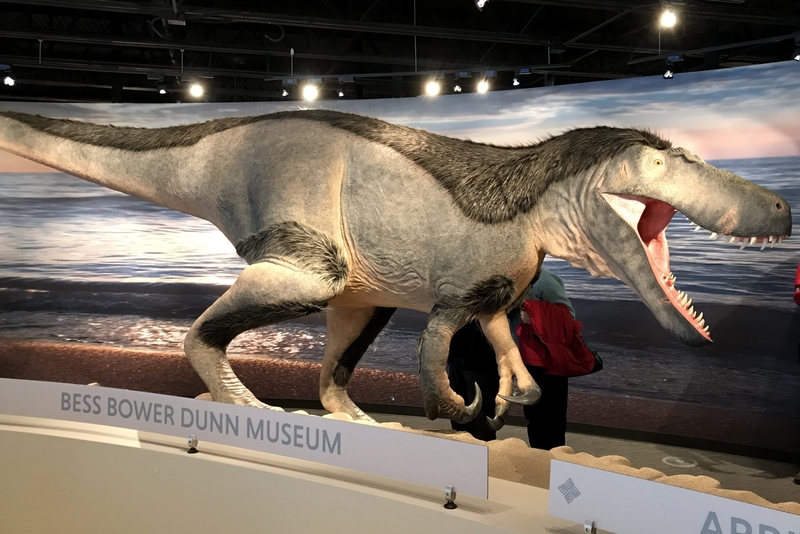 Never mind that no dinosaur fossils have been found in Illinois – Dryptosaurus lived on the other side of the Cretaceous continent of Appalachia, which is as good an excuse as any to include a giant model dinosaur. During the very well-attended opening event, Keillor gave a standing-room-only talk about creating the model. Dryptosaurus is only known from a handful of fossils, the most complete parts being the arm and leg. 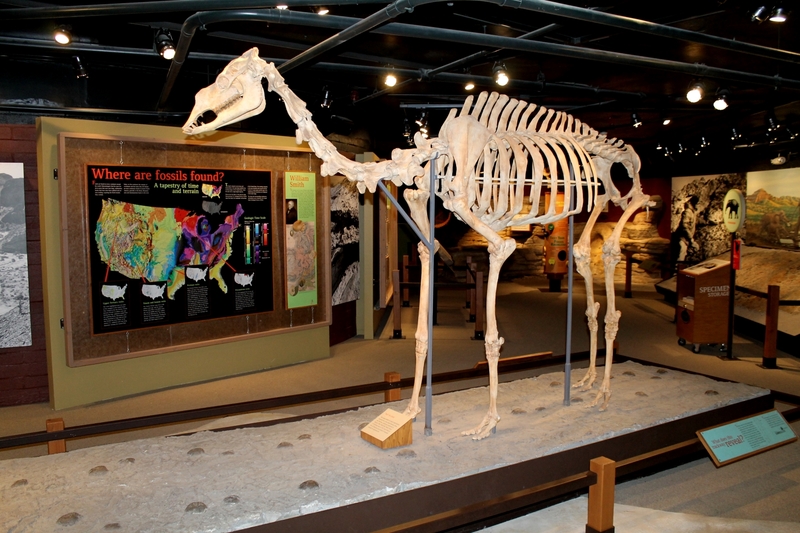 Working with Richard Kissel, who served as the project’s scientific advisor, Keillor had to make a number of educated choices to turn the available fossil material into a 20-foot fleshed model. The shape of the head, for example, is based on that of Jane, while the tiny, millimeter-sized scales are informed by recently published skin impressions of various tyrannosaurs. Less certain is the choice to give Dryptosaurus a two-fingered hand. 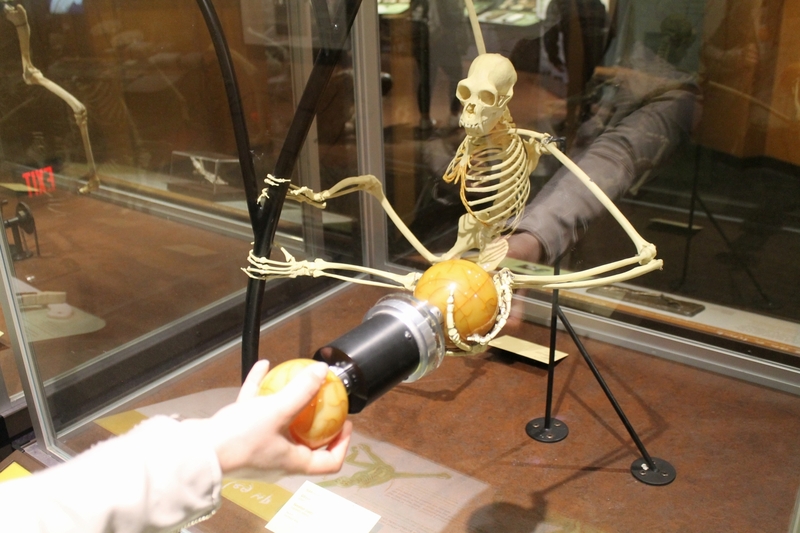 For the time being, the three-fingered skeletons Research Casting International built for the New Jersey State Museum are no less reasonable. Opening day at the Dunn Museum was mobbed – it’s great to see so many people excited about a new museum! Keillor’s 2009 Dryptosaurus head is meant to be a male, while the new sculpture represents a female. During the planning stages, Keillor prepared three possible poses for the museum to pick from. 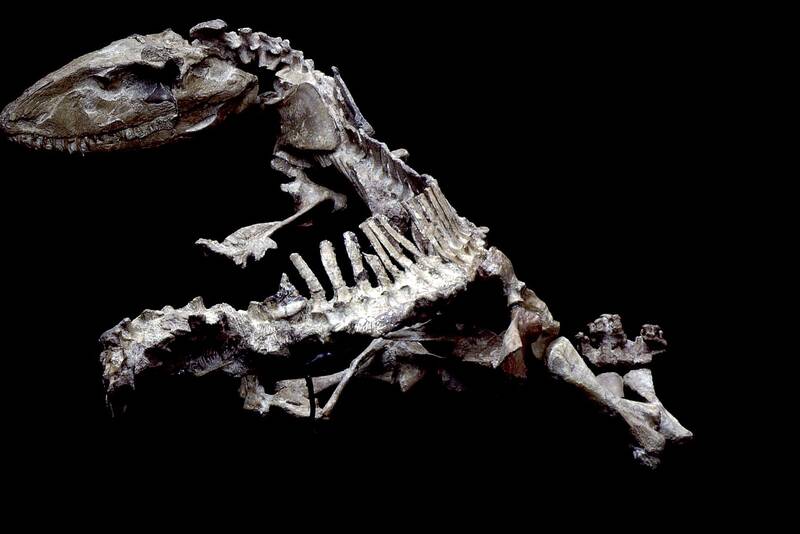 The Dryptosaurus could be standing tall, leaning forward with its mouth open, or crouching down next to a nest mound. Keillor favored the nesting pose, both because it was unusual and because the Dryptosaurus holotype fossils may have come from an animal that had recently laid eggs*. Unsurprisingly, museum staff opted for the more spectacular open-mouthed version. The bulk of the model is foam, created on a milling machine using data from a digital model produced by Keillor. The foam body form is covered with nearly 200 pounds of epoxy putty, applied and textured by hand. Keillor casted the head as a separate piece, using the molds from a standalone Dryptosaurus head he produced for the Dunn Museum’s predecessor in 2009. The patches of fluff are made from a commercially-available synthetic fiber that resembles kiwi feathers. *Edward Cope noted in the 1880s that the Dryptosaurus limb bones had large, hollow medullary cavities. Gravid female birds grow extra layers of bone in their medullary cavities to stockpile calcium, which they use to produce eggshells. We now know that several non-avian dinosaur species did the same. Little Clint at the Dinosaur Discovery Museum. 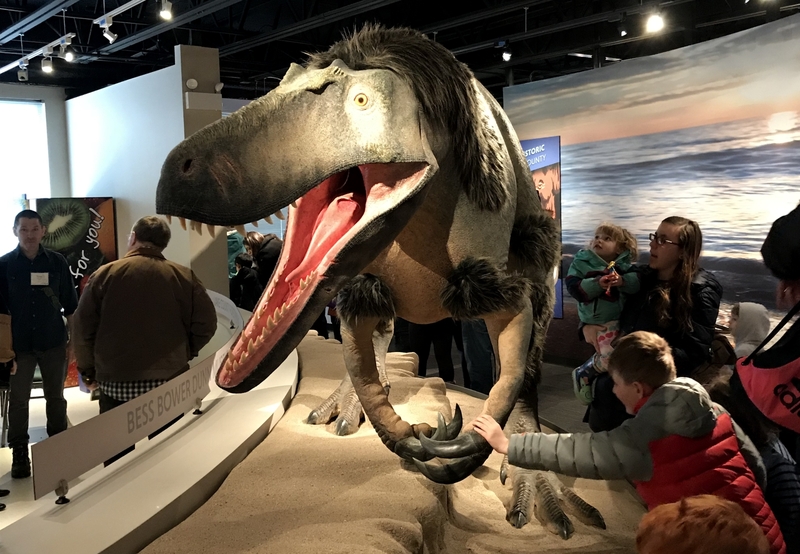 Keillor’s other new model is “Little Clint” the infant Tyrannosaurus rex, which debuted at the Dinosaur Discovery Museum in Kenosha, Wisconsin with absolutely no fanfare. The model is part of a new exhibit all about the discovery and interpretation of the pocket-sized T. rex fossils it’s based on. Frustratingly, there’s no mention of the exhibit on the museum’s website, and I would have never known about it if Keillor hadn’t mentioned it (I’m sure it’s not the museum’s fault, I too have known the joys of working within the constraints of a large municipal website). The model is roughly two and a half feet long, and is almost grotesque in its spindly proportions. Judging by photos accompanying the model, Keillor used a traditional build-up process, rather than the physical-digital hybrid techniques employed in the making of the Dryptosaurus. Dryptosaurus and Tyrannosaurus both belong to the same group of theropod dinosaurs (tyrannosaurs), but in creating the two models Keillor went in two very different directions when reconstructing their soft tissues. 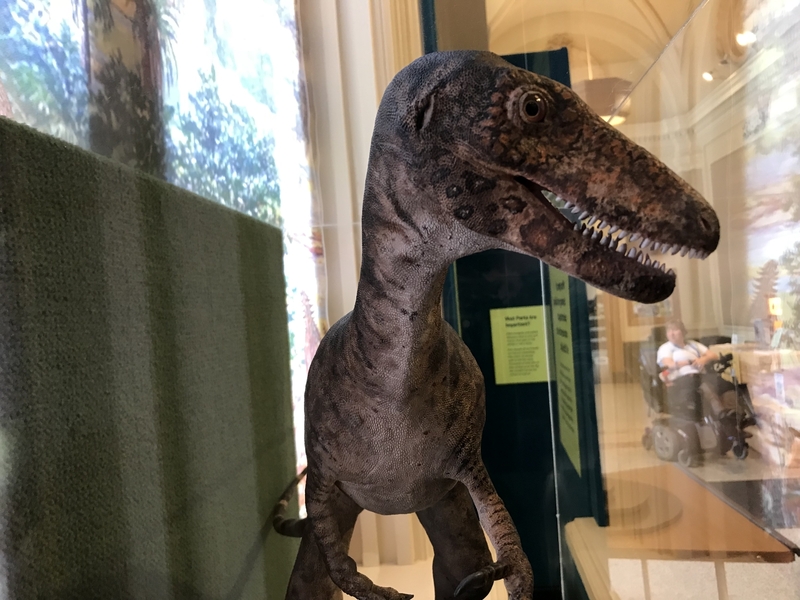 Working with Richard Kissel of the Yale Peabody Museum, Keillor gave Dryptosaurus a patchy coat of shaggy integument, as well as fleshy lips that would easily cover the animal’s teeth if it were to ever close its mouth. 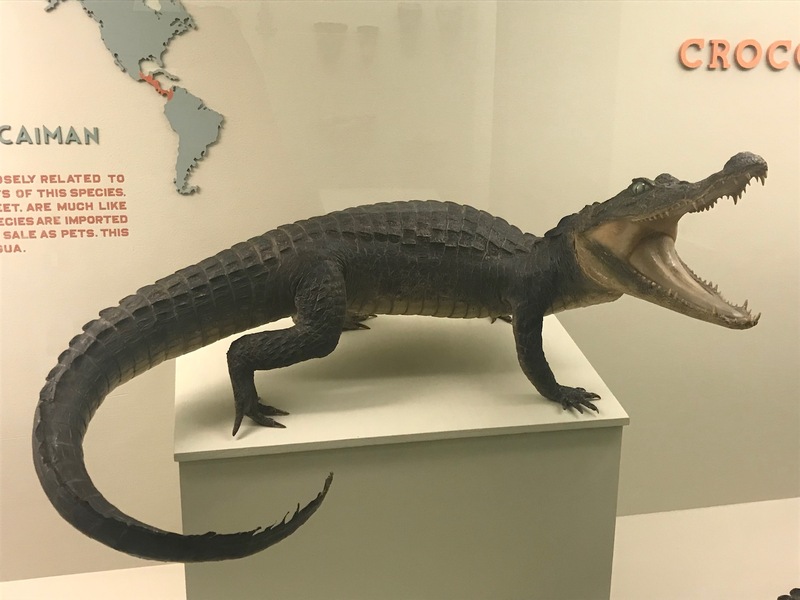 However, Carthage College’s Thomas Carr, scientific advisor for Little Clint, requested a scaly hide with a crocodilian tooth-exposing grin. It turns out feathers and lips on large theropods (and tyrannosaurs in particular) are fairly contentious subjects, at least among the sort of people who like to argue about these things on the internet. It is well-established that feathery integument was widespread among theropods, and even certain other dinosaurs. Several members of the tyrannosaur family have been found with fossilized fuzz impressions, including the Dryptosaurus-sized Yutyrannus. This means it’s reasonable to expect that all tyrannosaurs, including Tyrannosaurus rex, were feathered to some degree. 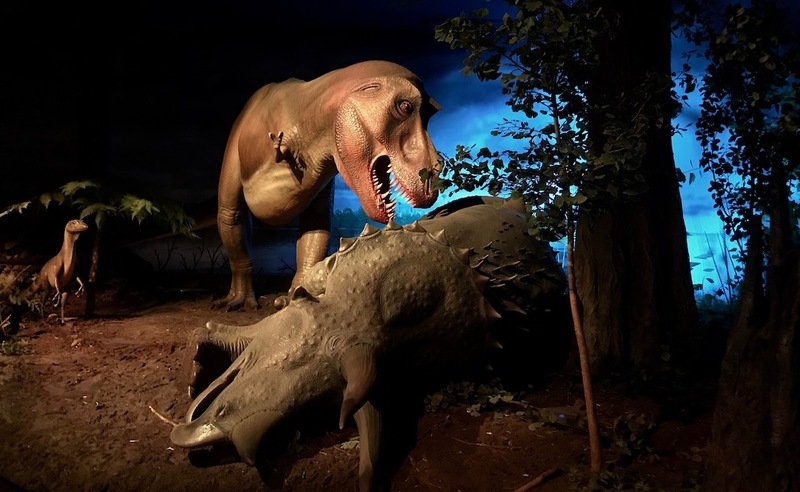 However, a recent publication by Phil Bell and colleagues suggests the opposite: an assortment of small skin impressions from Tyrannosaurus and its closest relatives reveal only scaly skin. 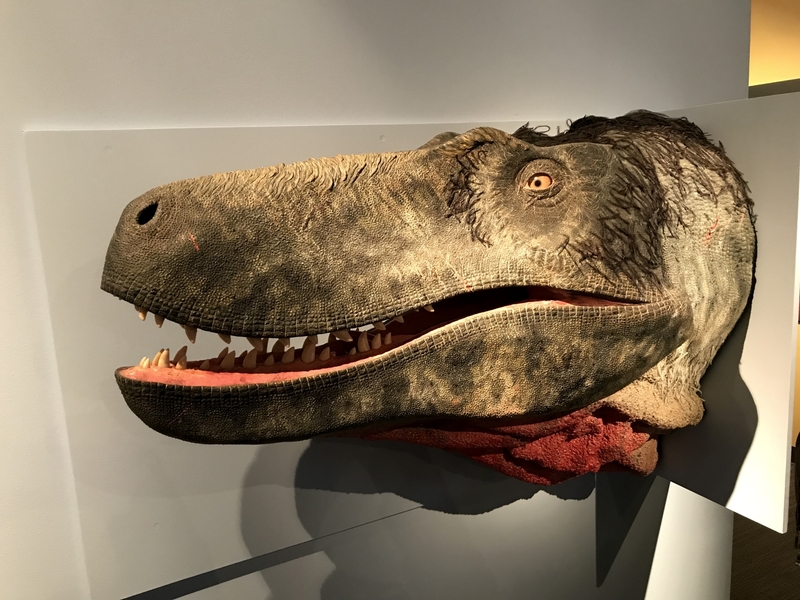 Meanwhile, ongoing research by Robert Reisz demonstrates that theropods had fleshy lips, but this is contradicted by Carr’s own findings that some tyrannosaurs had armored scales on their maxillary margins. So which interpretation of tyrannosaur soft tissue is right? For now, there is compelling evidence for both interpretations. Perhaps more fossils or new analytical techniques will eventually steer the consensus in one direction or the other. Or maybe we will never know for sure what the faces of Dryptosaurus and Tyrannosaurus looked like. For now, Keillor’s models make fascinating companion pieces. They are windows into two possible versions of the deep past, reminding us to accept a little ambiguity now and then. 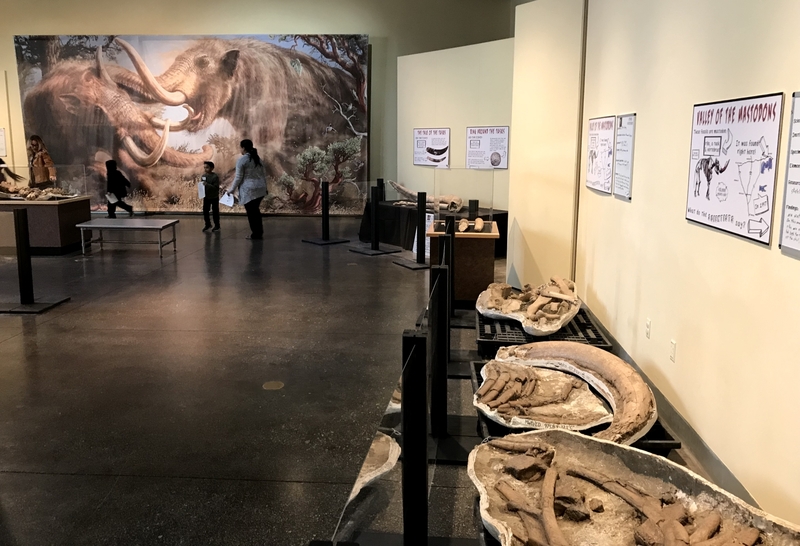 After visiting the La Brea Tar Pits and the Natural History Museum of Los Angeles County, we headed to Claremont to check out the Raymond M. Alf Museum of Paleontology. I had heard lots of good things about the Alf Museum and have been wanting to check it out for some time. Many, many thanks to Curator Andy Farke (as well as Lucy Herrero and Gabriel Santos) for generously taking the time to show us around! 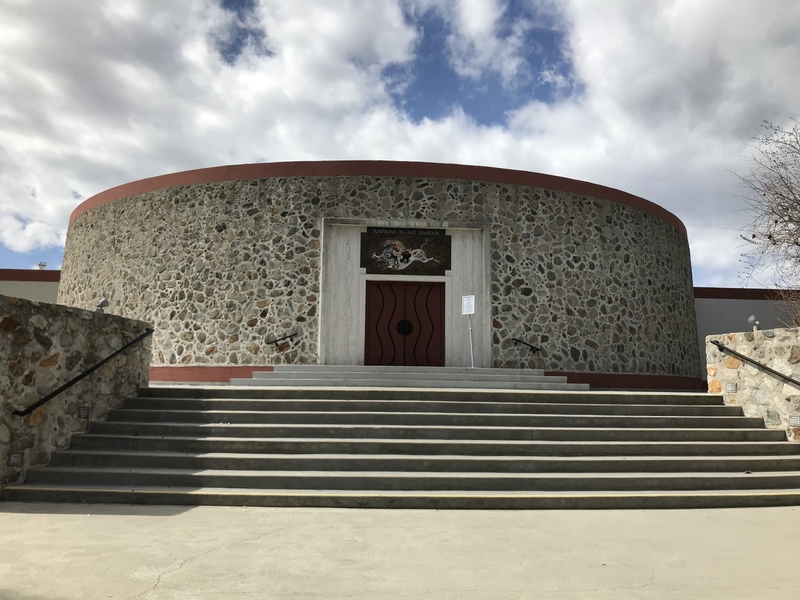 The Alf Museum is housed in a distinctive circular building, with a peccary mosaic over the door. The Alf Museum is extremely unique. Located at the Webb School in Claremont, it is the only nationally accredited museum on a high school campus. The museum grew out of the collection of Webb teacher Raymond Alf. Though he was not a paleontologist by training, Alf became hooked on fossils after finding a Miocene peccary skull on a 1936 trip to the Mojave Desert. 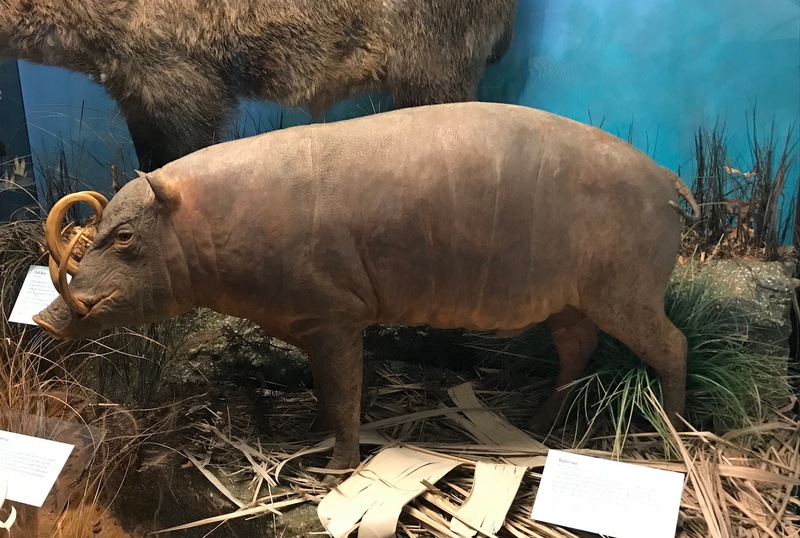 Alf continued to take students fossil hunting year after year, building a sizable collection in the basement of the library and any other storage space he could find. In 1968, alumi and school administrators came together to establish the non-profit Alf Museum, with Raymond Alf himself serving as its first director. Alf passed away in 1999, but lived long enough to see his museum become an internationally recognized research institution. Webb School students continue to take an active part in collecting and research at the museum. All students go through a paleontology course in 9th grade, and about a fifth of the student body remains involved afterward. 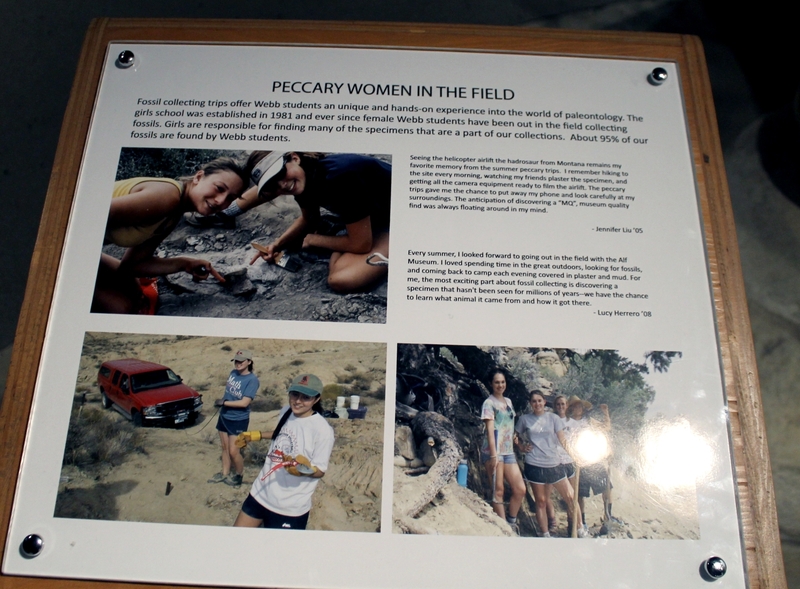 95% of the museum’s 140,000 fossils were found by students on “peccary trips” to California, Utah, and Arizona. Students also lead tours and work in the state-of-the-art fossil prep and digitization labs. To date, 28 students have co-authored technical papers before graduating, all of which are proudly displayed at the museum. 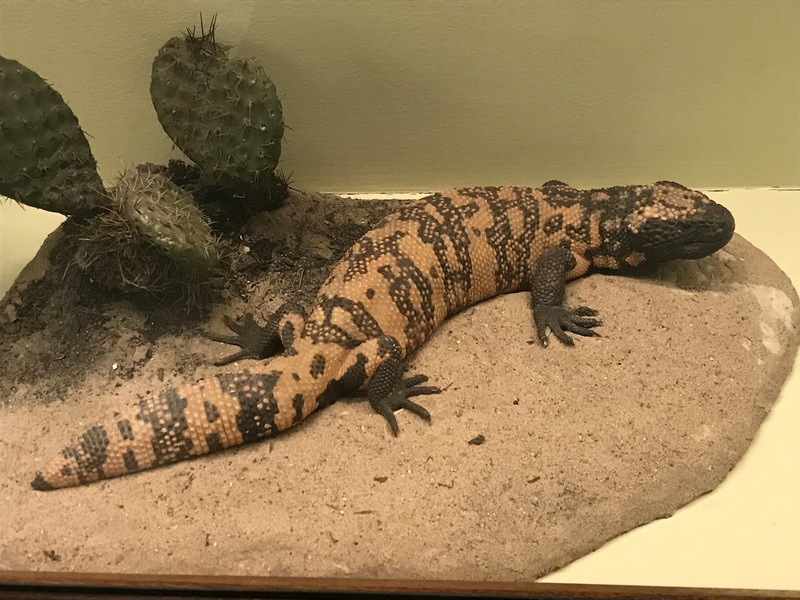 Alf and a group of students collected this Permian reptile trackway in 1967 near Seligman, Arizona. In the Hall of Footprints, mounted skeletons are cleverly placed over real fossil trackways. There are two exhibits at the Alf Museum, each taking up one of the two floors. The lower level houses the Hall of Footprints, which was last renovated in 2002. 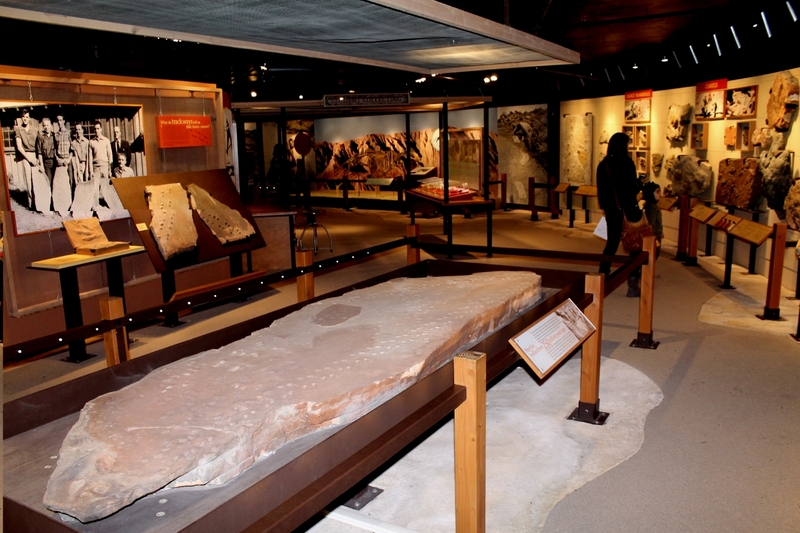 This exhibit showcases one of the largest fossil trackway collections in the United States. 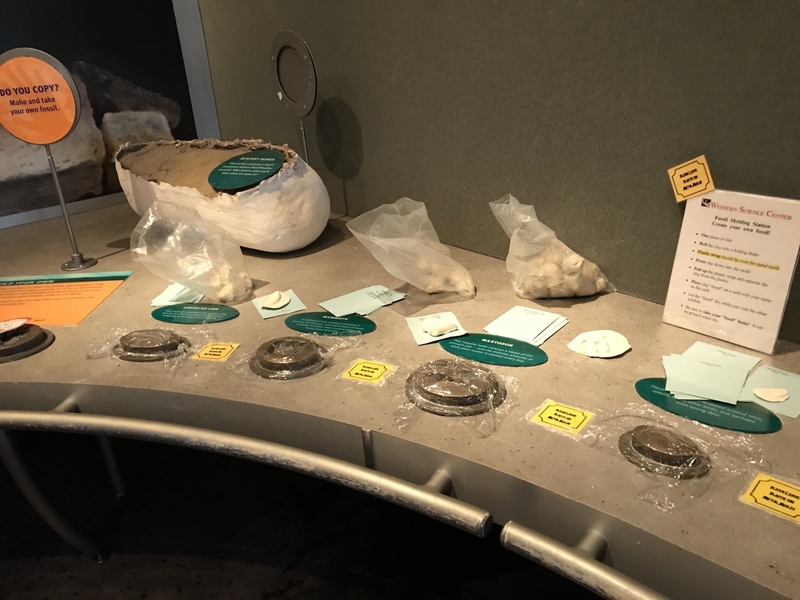 Trace fossils on display range from Permian reptiles and insects to Cenozoic elephants and camels, as well as important holotypes like the world’s only known amphicyonid (bear-dog) trackway. To quote Dr. Farke, much of the footprint collection was acquired by “being stupid.” Despite being miles from any road, Alf and his students would cut colossal track-bearing slabs out of the bedrock by hand. Between the logistical problems and the availability of digitization techniques like photogrammetry, few modern ichnologists would condone Alf’s practices. On the other hand, his recklessness ensured that these fossils are available for study today, even after many of the source localities have weathered away or been vandalized. The main level’s Hall of Life is a more traditional walk through time, but with an Alf Museum spin. Visitors follow the circumference of the annular building, starting with the origin of the universe and progressing chronologically through the major milestones in the evolution of life on Earth. The bigger, showier aspects of the exhibit are not unique to the museum. 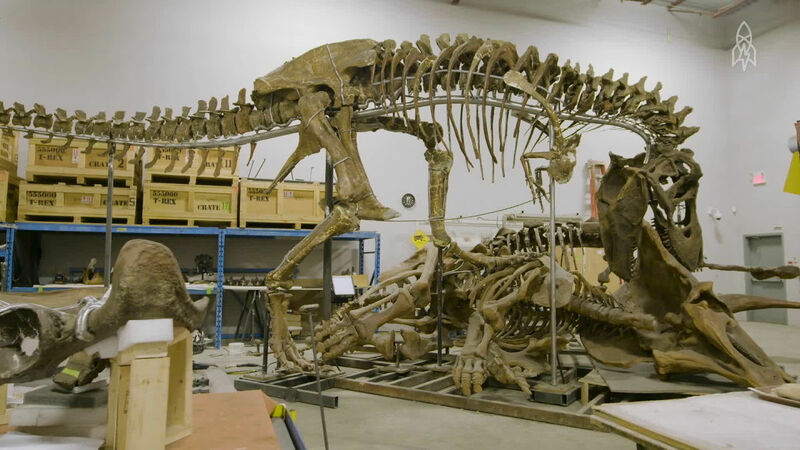 There’s a cast of the Red Deer River Centrosaurus from the American Museum of Natural History, and a composite cast of a Cleveland-Lloyd Allosaurus. A model of the famous transitional fish Tiktaalik has an identical twin at the Field Museum. Like many modern exhibits, walls are filled in with large murals and a varied color palate is used to demarcate themed sections. Different audio tracks throughout the exhibit are subtlety employed in the same way (the sound of buzzing prairie insects symbolizing the rise of grasslands in the Cenozoic is particularly inspired). Showy dinosaur casts undoubtedly draw visitors’ attention. 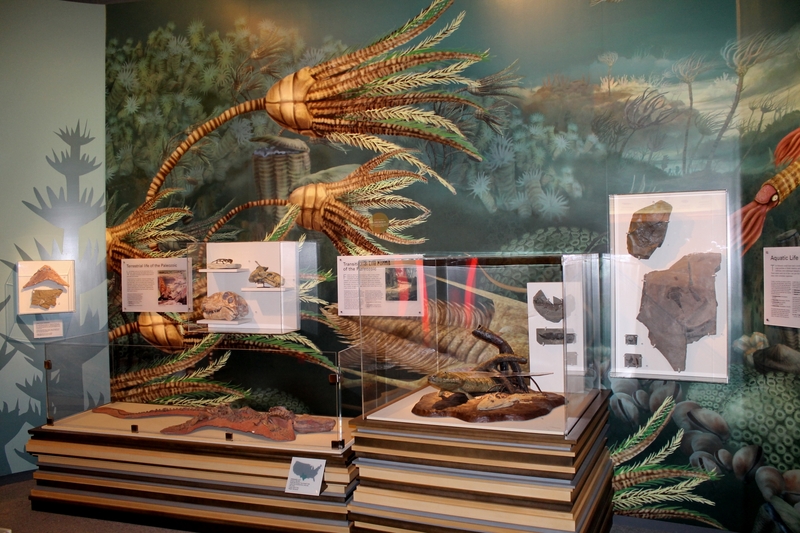 Original and cast specimens from the Paleozoic are illustrated by one of several murals by Karen Carr. Once one looks past the more ostentatious parts of the display, the Alf Museum really gets interesting. Since Dr. Farke was involved in the Hall of Life’s 2011 renovation, he could explain the design choices in detail. Some of these follow Farke’s own sensibilities. For instance, the scientific method and the evidence for evolution are strongly emphasized. Most labels are implicitly written to answer the question how do we know? Interactives tend to be of the analog variety, and multimedia is only used to illustrate things that could not be effectively shown with a static display. One example is a video where a computer model of a pterosaur skeleton demonstrates the quadrupedal launch hypothesis. 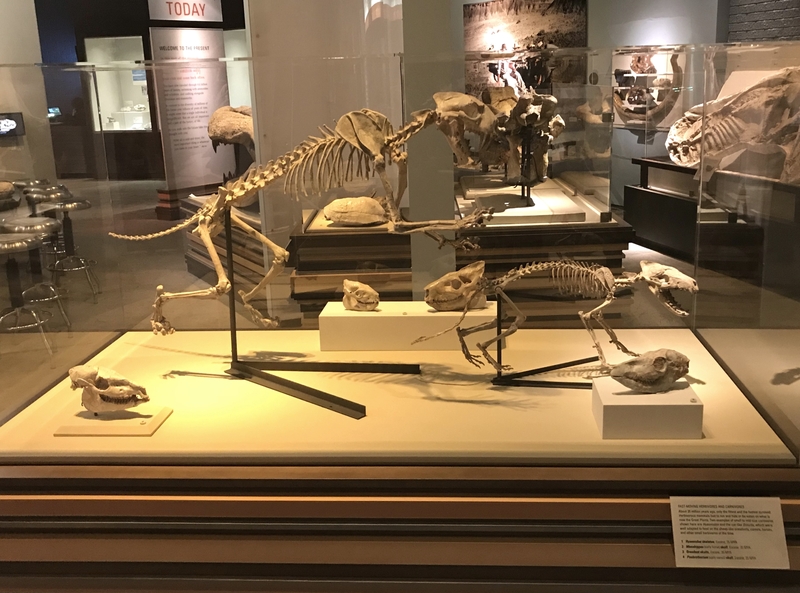 Expressive Dinictis and Hyaenodon mounts welcome visitors to the Cenozoic. Student stories and quotes can be found throughout the exhibits. The most thought-provoking thing that Farke told me was that the Alf Museum is intended for three distinct audiences. There are the regular museum visitors, seeking a generalized look at paleontology. Then there are current Webb School students, who make use of the museum as part of their classes. Finally, there is the larger cohort of Webb alumni, who want to see specimens they remember from decades past (including fossils they collected themselves) and to reflect on their time at the school and on Raymond Alf himself. It is the nods to this third group that make the Alf Museum’s exhibits uncommonly special. Even as an outsider who had never met a Webb student and was just learning about Alf’s legacy, I found that the museum has a palpable sense of community. Between the photos of beaming students on peccary trips to the unattributed Raymond Alf quotes printed high on the walls, the shared experiences of the Webb School community are intractably situated within the exhibits. Objects on display are illustrative specimens, but they are also more. Each one represents a rich tapestry of people, places, and experiences, and embodies a sort of collective memory starting with its discovery and extending into the present day. For me, at least, this is what natural history is all about.